Bring Minnie & DaisyTo the Party! You asked for it so we ordered it and it just got here. Introducing the Minnie Mouse Bounce House. Be the first to have this incredible bounce house at your next party. 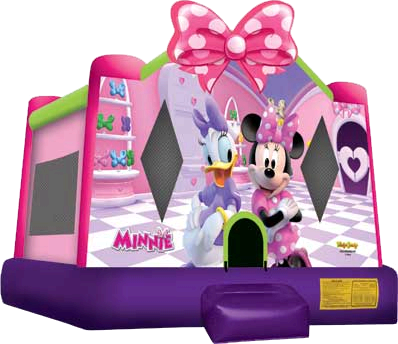 This is the Amazing Minnie Mouse and Daisy Duck Bounce House. This beautiful bright Disney bounce house rental was designed with all girl colors for that special birthday party. The Minnie Mouse Bounce House has bright girl colors for the best party ever. Kids of all ages will enjoy bouncing all over the Sacramento, Roseville, Folsom, and surrounding area.